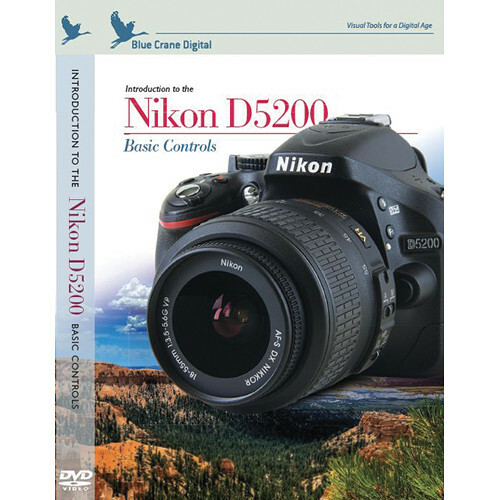 The Introduction to the Nikon D5200: Basic Controls DVD from Blue Crane Digital is a training video that teaches you how to use the primary controls and settings of your DSLR camera. Gain the knowledge you need to capture the best possible photos and videos in a broad array of shooting situations, and see and follow along with practical demonstrations. The easily accessible DVD features a host who walks you through the activation of functions, adjustment of settings, and implementation of key photographic techniques. The following topics are covered and conveniently arranged in chapters: video and audio recording, live view photography, scene modes, using the flash, tips for improved composition, image playback, advanced exposure modes, ISO, white balance, metering, exposure compensation, special effects modes, custom settings and more. Box Dimensions (LxWxH) 7.5 x 5.5 x 0.5"
DVD: Introduction to the Nikon D5200: Basic Controls is rated 5.0 out of 5 by 4. Rated 5 out of 5 by Deb from DVD was so helpful This was a great tool. I used it alot to help me learn my camera. Rated 5 out of 5 by Catalfio from a amazing way to learn n5200 great info in a manner easy to under stand. This DVD have spanisch speak or subtitules?? I'm sorry but this DVD is English only.